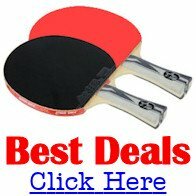 Ozarks Table Tennis Club is located in the heart of the United States, in the city of Springfield and in the state of Missouri. Our address is 1408 East Pythian Street, Springfield, Missouri (Corner of Pythian & Fremont). We play inside the Greence County Recreation Center - more commonly known as the O'Reilly-Tefft gymnasium. The club has been active in staging tournaments since 1997. We have staged 33 tournaments with 27 of them being sanctioned and in affiliation with the USATT. Our largest tournament to date had 122 players from 10 states in attendance. It was a 3-Star tournament with $5500 in prize money. Visitors are always welcome at our club. So please stop by and join in. We can usually accommodate from 25 to 35 players on our gym floor. The cost is $3 for those 16 and over and is free to those 15 and younger. We play from 1:30 pm till 5:30 pm each Sunday afternoon. We also have seasonal play through the summer months, usually on Thursday evenings. Check out our web site for specific details in the summer months. Our club utilizes 14 tables. We have 7 Butterfly Centerfolds, 4 Killerspin RADs, 1 Stiga Expert and 2 Joola Infinities and from time to time we sell brands to individuals wanting a table which has been refurbished. We have excellent lighting, excellent wood floor and plenty of side and back lengths. There are showers and an area to reglue rubber. We usually have between 20 to 28 players show each playing session. Be there first and you can play more matches and have more fun. We have players in all age ranges and talent levels. Come by, visit, play and get to know one another. 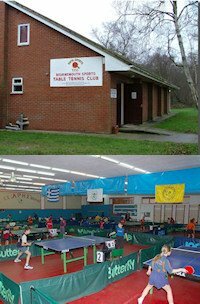 We stage from 3 to 4 table tennis tournaments each year. We also stage "mini-tournaments" from time to time at the club. Sign up in the foyer if you'd like to participate in one of these fun events. 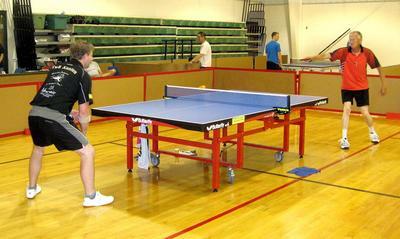 We will also be building another web site soon, so just Google "Springfield Missouri table tennis"